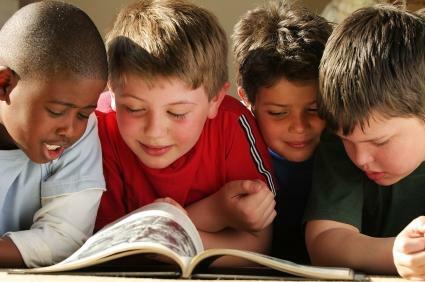 Stocking your child's library with learn to read books can be a good way to help him master important literacy skills. A large part of learning how to read involves mastering the use of sight words. Sometimes called the Dolch Word List, sight words are some of the most commonly used words in the English language. There are only about 200 sight words, but these words comprise 50-70% of any non-technical text. Can a Baby Really Learn to Read? Children start to learn sight words in kindergarten and first grade. By first grade, many children have mastered enough sight words to read simple sentences independently. At this point, they start learning how to sound out unfamiliar words. Many schools expect students to be able to read short paragraphs of text, such as what you would find in a picture book, by the time they have finished second grade. By third grade, children should be reading chapter books, and have strong reading comprehension skills. A child who is still struggling with reading by fourth grade runs a risk of having serious academic problems, since this is when reading to learn new information becomes a vital part of coursework. Doesn't know short vowel sounds such as the "a" in "apple"
Most stores that sell children's books sort titles by age recommendation. This can provide a good starting point for choosing appropriate books, although you will want to keep in mind that not all children learn to read at the same speed. Meet the Sight Words: Based on the Preschool Prep DVD series by the same name, these books will help your child master essential sight words. Bob Books: These books are short stories that each build on a different skill in order to teach a child how to read. There is only a line or two of text per page, but this helps ensure that children won't become frustrated by the lesson. Starfall Learn to Read Phonics Set: These stories feature engaging characters and simple text that is sure to help young readers build confidence in their skills. Hooked on Phonics: This is a complete reading program that includes a library of 22 books, as well as flash cards, worksheets, audio CDs, and other supplementary materials. You Read to Me, I'll Read to You: This is a collection of short stories designed for parents and children to read together. This can be a fun way to incorporate reading lessons into your day, since many of these selections would work well as bedtime stories. LeapFrog Learn to Read: Designed to work with the electronic Tag Reader, this series of books teaches phonics lessons with familiar LeapFrog characters. The sound effects and interactive elements make this a fun way to review reading skills, but some children may find them distracting.